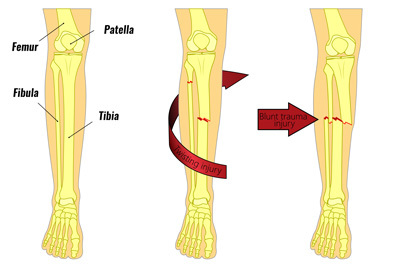 A fibula fracture can occur at the same time as a tibia fracture, or they can occur on their own in isolation. They are usually caused by landing on a twisted foot, or from direct impact or trauma. Immediate medical attention is needed if a lower leg fracture is suspected. Stress fractures of the fibula can also occur from overuse or repetitive strain. Fractures of both the tibia and fibula bones in the lower leg will usually be fairly obvious. Severe pain usually following an impact, collision or fall is accompanied by rapid swelling. Weight bearing will be impossible and the lower leg may be deformed. A fibula fracture where there is no fracture of the tibia can also occur from landing on a twisted foot, or from direct impact to the lower leg. However, pain in the calf area is likely to be a lot less than a combined tibia-fibula fracture. Depending on the severity of the injury, the patient may only complain of tenderness over the area of the fracture. The athlete will most likely limp or be unable to bear weight on the fractured leg. In more severe cases there will be deformity where bones have been displaced. It is possible an athlete can continue to compete with a broken fibula as in the case with American athlete Manteo Mitchell who completed the first leg of a recent Olympic 4x400m heat in a split time of 45 seconds, having broken his fibula within the first half of the race. Symptoms of fibula stress fractures tend to include a gradual build-up of pain on the outside of the lower leg which eases with rest and increases with activity. It may be tender over the point of the fracture and there may be an aching or throbbing pain at night. See fibula stress fracture for more detailed information. The fibula is the smaller of the two shin bones on the outside of the lower leg. It can be felt as the bony lump on the outside of the ankle called the lateral malleolus and runs up the outside of the leg to the knee. Its purpose is mainly to provide a surface for muscles to attach to whereas the large Tibia bone bears most of the weight. A Maisonneuve injury occurs when the membrane connecting the tibia and fibula at the ankle is torn (high ankle sprain), along with a fracture higher up the fibula. This may appear as a simple fibula fracture with mild to moderate pain when the ankle is unstable and requires surgery to stabilize the ankle joint. Traumatic fractures of the Fibula can occur with a severe ankle sprain. An avulsion fracture happens when a ligament pulls part of the bone away. 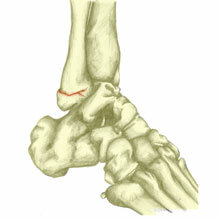 A fracture of the bony bit on the outside of the ankle known as the malleolus is called a Pott’s fracture. Read more on Pott’s fracture. Stress fractures of the fibula do sometimes occur, although these are far less common than stress fractures of the tibia as the fibula is not a load-bearing bone. They are more likely to be caused by repetitive muscle traction forces on the bone. Assuming the stability of the ankle is not affected then treatment for a fibula fracture is rest, pain relief medications as required and the use of crutches. Once the bone has healed then rehabilitation exercises for the lower leg including stretching, strengthening, proprioception and sports specific or functional exercises.